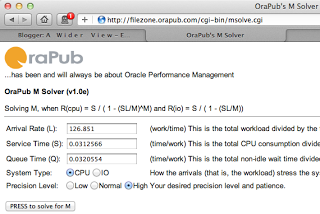 Have you ever wondered why tuning Oracle improves performance? There are of course obvious answers, but then there are the deeper answers. More profound answers. It's like answering the question, "Why is the sky blue?" Sure you can say, it because the sun's light rays are scattered when they hit the Earth's atmosphere. But then why does scattering the light rays turn the sky blue? And it goes on and on. 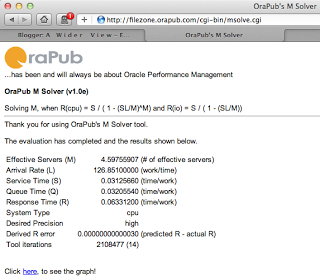 It can be just like that with optimizing Oracle Database performance. 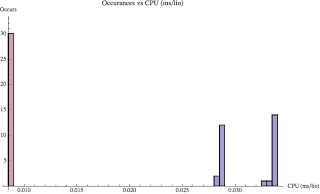 Last month I blogged about Oracle Database cache buffer chain (CBC) latches, CPU consumption, and wait time. In that posting I demonstrated that by adding cache buffer chain (CBC) latches to a CBC latch constrained system the CPU consumption per logical IO decreased. If you look closely at my data collection script, you can easily see how I captured, stored, and retrieved the performance data. You can download the data collection script here. The SQL elapsed times where gathered using the OraPub SQL Elapsed Time Sampler. Also look at the elapsed time tools in my OSM toolkit. You can download the raw data text files ( 256 latches, 32768 latches) and the Mathematica analysis notebook ( PDF, notebook). The main point of this posting is to demonstrate that when we tuned Oracle Database by adding additional cache buffer chain (CBC) latches, we effectively altered the Oracle kernel code path making it more efficient AND the resulting LIO response time changed as Operation Research queuing theory states! 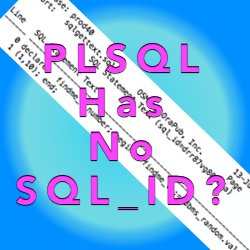 How The Oracle Database Determines Wait Time When It's Not Set Giving Twitter A Try...@CShallahamer Do PLSQL Procedures And Anonymous Blocks Have A SQL_ID?